At the beginning of 2004, the US government announced its intention to withdraw from the International Space Station program and, instead to return American astronauts to the Moon. NASA's space station partners were left to decide for themselves where to go in space. Initially, Russians tried to convince Europeans to pull resources to develop a new generation reusable space plane, however in December, European ministers rejected the idea. A new plan for the Russian-European cooperation in the manned space program was conceived around spring of 2006. This time, two sides considered combining funds, hardware and expertise to parallel the US effort to return astronauts to the Moon. The idea was based on previous studies, which looked at upgrading the European ATV cargo ship with a Russian-built reentry vehicle, which would enable it to return cargo or even people to Earth. Russian and European space officials were expected to choose what they identified as an "initial preferred concept" for a future manned spacecraft, as early as May or June of 2007. However, political problems inside Russia and between two partners delayed the project. Disagreements over the direction of the Russian space program resulted in the ouster of Nikolai Sevastyanov, the head of the nation's prime contractor in the manned space flight -- RKK Energia. The Russian-European talks resumed in September 2007. Initially, Russian and European space officials chose a bell-shaped crew module as a preferred configuration for the next-generation manned spacecraft. The new vehicle could accommodate from four to six people on a journey to the lunar orbit. However by the beginning of 2008, a cone-shape capsule, resembling NASA's Apollo spacecraft, had emerged a winner. By the beginning of 2009, the negotiations between Roskosmos and ESA broke down due to numerous technical and political issues. Instead, Roskosmos ordered its industry to come up with the proposals for the new-generation spacecraft. Upon choosing the prime developer in April 2009, the agency expected the industry to complete the preliminary design of the vehicle by June 2010. In January, speaking at the 34th Korolev Readings, the head of RKK Energia Vitaly Lopota said that early missions of the PTK NP spacecraft could take place from Baikonur, Kazakhstan. The Ukrainian-built Zenit launcher or a similar Russian-built vehicle would be a likely candidate to carry the spacecraft, since the rocket had the payload capacity of up to 13 tons, needed to lift the future spacecraft and the Zenit had an operational launch pad in Baikonur. Refining design of the spacecraft and its components became the main purpose of this phase of development known as the Technical Project. In addition to the work on blueprints and manufacturing of various elements for experiments, the Technical Project also included the construction of full-scale prototypes of the spacecraft. Anticipating the latest direction of the Russian space policy and possible budget restrictions, RKK Energia quietly dropped its plans to develop several variants of PTK NP ships for servicing the space station, autonomous flights in the Earth orbit or reaching into deep-space. Instead, a single spacecraft with the primary goal of carrying crews to lunar orbit has emerged as the focus of the PTK NP project during 2012. With the completion of the design, the PTK NP project reached crossroads, as the Russian government had to commit the spacecraft to metal (and real expenses), postpone it or cancel it altogether. Ironically, Russian space agency was facing this critical decision, as NASA's leadership publicly rejected a leading role for the US in any lunar-landing effort. During 2014, the development of the next-generation manned spacecraft, PTK NP, was to go from the drawing board to experimental prototypes but a virtual absence of accolades in the official Russian media about development progress could spell trouble for the project. This silence became really deafening as NASA brought a prototype of its Orion spacecraft to the launch pad in December for an unmanned test mission. During 2015, Russian engineers re-tailored the prospective human space flight program for lighter, cheaper rockets to reflect severe cuts in the nation's space budget in the previous year. According to the latest plans, the next-generation spacecraft could carry its first crew in 2024, followed by a manned mission into lunar orbit in 2025. In 2016, technical and financial problems forced the developers to abandon a four-launch scenario for the lunar expeditions based on Angara-5V rockets. To reach anywhere beyond the low Earth orbit, the new-generation transport ship had to fall back to a non-existing super-heavy launcher. Still, a lunar expedition remained the official goal of the Russian space program, even though Russian cosmonauts were not expected to walk on the Moon until at least 2030. In 2017, developers were preparing to build the first major experimental components of the PTK Federatsiya spacecraft for initial full-scale tests. In the meantime, Roskosmos switched PTK's rocket again, this time, from the Angara-5P to the Soyuz-5. It also meant that the flight testing of the Federatsiya would now originate from Baikonur. The first launch had to be postponed to 2022. The latest financial problems in the Russian space program forced the developers of the PTK Federatsiya spacecraft to drastically simplify its sophisticated rocket-powered landing system and emergency escape rockets conceived for the original version of the next-generation spacecraft. The long-delayed work on Russia's new-generation transport spacecraft might be postponed again, experts familiar with the matter say. Like all its predecessors, the PTK Federatsiya spacecraft will be equipped with an emergency escape system, SAS, specifically designed to pull the crew capsule to safety in case of a launch vehicle failure during the ascent to orbit. In 2017, the developers of the PTK Federatsiya spacecraft redesigned its Emergency Escape System to save time and money in the early phase of the program. After several years of early research, engineers at RKK Energia defined the overall structural design of the crew module during the preliminary development of the PTK NP project in 2010. The conical structure of the module was subdivided into the command compartment, KO, and the aggregate compartment, AO. In turn, command compartment would be split into a pressurized cabin and the unpressurized upper transfer section. 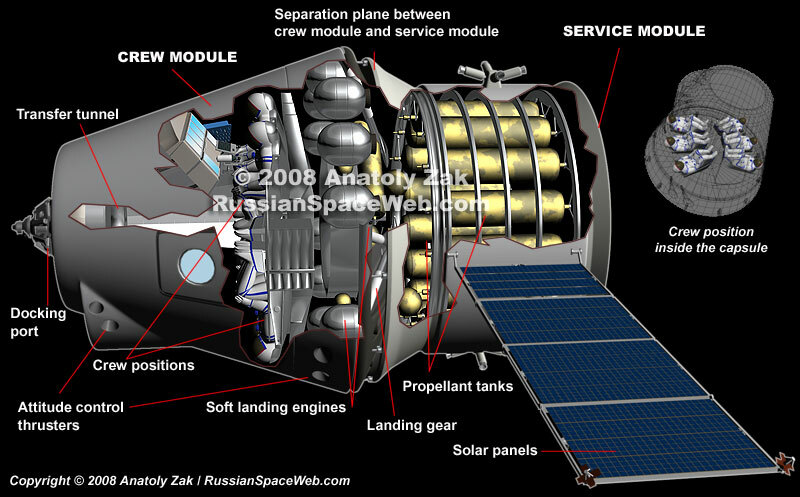 The cone-shaped Return Module, VA, of the Federatsiya spacecraft is structurally subdivided into two sections: the Command Compartment, KO, containing the cosmonaut cockpit, and the Aggregate Compartment, AO, located below. It contains the soft-landing propulsion system, attitude control thrusters, landing gear and the main heat shield. The expendable propulsion module, known in Russian as Dvigatelny Otsek or DO, of the PTK spacecraft was designed to accommodate the ship's propulsion system, including a dual main engine and eight clusters of attitude control and orientation engines, DPOs, distributed around the module. The defining feature of Russia's new-generation PTK spacecraft would be its landing system. Due to the political requirement to land future manned missions in Russia, while the spacecraft would barely overfly south of the country, a lot of maneuverability was required from the descent module. At the same time, tough deadlines imposed for the development of the vehicle and limited funds, did not leave time for radically innovative solutions. The Return Module, VA, of the PTK Federatsiya spacecraft was originally designed to land under rocket power. Although parachutes were eventually added to the landing system, the solid propellant motor could still give the crew capsule unique maneuvering capabilities during braking in the final moments before the touchdown. Taking into account a switch to Baikonur launches, RKK Energia revisited the use of more traditional landing engines, which had been in use on the Descent Module of the Soyuz spacecraft for decades. Moscow-based MKB Iskra, which developed the landing engine, studied the idea during 2017 and confirmed that it could modify the existing engines and adapt newly developed thrusters for the new role. A defining feature of Russia's new-generation PPTS spacecraft would be its landing system. Due to the political requirement to land future manned missions in Russia, while the spacecraft would barely overfly south of the country, a lot of maneuverability was required from the descent module. At the same time, tough deadlines imposed for the development of the vehicle and limited funds, did not leave time for radically innovative solutions. Unlike the Soyuz, where the docking port is discarded and burns up in the atmosphere along with the habitation module of the spacecraft at the end of each mission, the new-generation PTK spacecraft will carry its docking mechanism on the descent vehicle, VA, which was designed for at least 10 flights. In 2018, developers redesigned the next-generation crew vehicle to make possible its visits to the international gateway in the lunar orbit in addition to trips to the Earth's orbiting space station. Russia's veteran Soyuz spacecraft was equipped with Kazbek cosmonaut chairs. Each Kazbek required a custom-made seat liners uniquely molded to the body size of each individual cosmonaut. Not surprisingly, developers of PTK NP hoped to do away with custom-built components, replacing them with a reusable seat that could be adjusted to any member of the cosmonaut corps, a foreign astronaut or a space tourist. One of the challenges Russian designers faced in developing the next-generation spacecraft in the first decade of the 21st century was the need for a new rocket to launch it. Since the future ship replacing Soyuz would have to carry six instead of three crew members and weigh from 12 to 23 tons, it would need much larger launch vehicle than existing Soyuz rocket capable of carrying just seven tons to the low-Earth orbit. The Angara's role as a carrier of manned spacecraft finally become official, after funding foes had killed the development of the competing Rus-M rocket in 2011. By that time, the Russian government had already launched the construction of a new cosmodrome in the Russian Far East and the Angara-5 rocket was promised a launch pad there. With the decision of the Russian space agency in 2012 to give priority to lunar missions, a super-heavy launch vehicle would be needed to carry PTK NP into deep space. In the following years, the Russian industry studied numerous architectures of the super rocket. In 2017, Roskosmos dropped plans to launch the Earth-orbiting version of the next-generation spacecraft on the modified Angara-5 rocket and instead opted for the yet-to-be developed Soyuz-5 booster conceived within the Feniks and Sunkar projects. To meet the June 7, 2017, presidential order for the start flight tests of PTK NP in 2022, developers added the launch of a simplified prototype into the test flight program The official schedule (No. 25-pl) for the development of the PTK system, which included the launch of the prototype, was issued on Feb. 20, 2018. By 2013, various sources enabled to compile an emerging picture of the flight test program aimed to validate the PTK NP spacecraft for manned missions. All these initial test flights were expected to originate in Baikonur. It is logical to assume that the switch of the PTK NP spacecraft to the Angara-5-derived launch vehicle based in Vostochny would require additional unmanned launches into low Earth orbit. According to a flight scenario evaluated in 2013, a Proton rocket would launch a Block DM space tug into the low Earth orbit. The second Proton would launch an unmanned test version of the PTK NP spacecraft. The two vehicles would then rendezvous and dock in orbit. The Block DM upper stage would then fire its engine sending the spacecraft toward the Moon. In 2009, Russian and European space officials started consultations on possible goals for the manned space flight after the end of the International Space Station, ISS, project. At the forefront of the talks were Russian plans to replace the ISS with a new manned outpost in the low-Earth orbit in 2020-2025. However unlike the ISS, which was designed to serve primarily as a research lab, the new station was conceived as an assembly point for missions to the Moon and Mars. In October 2010, Russian space agency, Roskosmos, published its requirements to the industry for the development of the Technical Project of the next-generation spacecraft, PTK NP. The document identified two versions of the spacecraft, which would be a priority for the Technical Project in the next two years. First of these two variants was a three-module PTK-Z spacecraft. It was designed for long-duration autonomous missions in the Earth orbit. By April 2012, the Russian space agency, Roskosmos, proclaimed a lunar orbit as the main destination of the PTK NP spacecraft. The agency asked engineers to design a vehicle capable of rendezvous and docking with the lunar orbital station, where the crew could transfer to a waiting lander for a final leg of its journey to the Moon. In the absence of a bold commitment to go to the Moon, Mars or asteroids, space planners in the US and Russia considered sending missions to the so-called Lagrange points, which could serve as staging hubs for deep-space exploration, if such projects ever became affordable.